Barrie, Ontario, December 22, 2014 — The “Dear Mr. Fantasy” baseball podcast has announced that Joe Pisapia has joined the show as the regular co-host, joining Chris McBrien on the weekly fantasy baseball podcast. Pisapia is the best-selling author of the “Fantasy Baseball Black Book” series and also is the co-host of the Sirius Satellite Radio program of the same name. The “Dear Mr. Fantasy” podcast began in January 2012 featuring radio and television personality Chris McBrien as host of the show. A permanent co-host was introduced in May 2012 with the addition of the ‘Fantasy Doctor’ and the show features different weekly guests from the fantasy baseball community. The podcast has continued to grow in popularity, culminating in a 2013 Podcast Awards nomination as well as a 2013 Fantasy Sports Writer’s Association award nomination as “Podcast of the Year”. In addition to featuring some of the top names in the fantasy baseball industry as guests, the Fantasy Doctor will continue to make appearances on the podcast on a regular basis. “We are very excited to make this announcement”, states McBrien. “Joe brings years of experience both in radio as well as from his writing. He will bring a strong element of fantasy analysis to the show. We’re glad that the Fantasy Doctor can still make appearances on the show as well. He has been a big part of the podcast over the past 3 seasons and leaves some big shoes to fill”. With fantasy sports growing in popularity annually, there has been an increasing need for more information and services on the topic. Fantasy sports now account for approximately $4 billion in annual economic impact across the sports industry. The RPV statistic was created by Pisapia and has been featured both in his book series as well as his satellite radio program. The statistic focuses on a player’s value in relation to others at his position as well as to the overall number of players in a league’s pool of potential picks. The “Dear Mr. Fantasy” podcast is recorded weekly from February through October and is available through a wide range of channels including iTunes, Stitcher Radio, the Fantasy Sports Network cable television channel and the Armed Forces Radio Network, just to name a few. 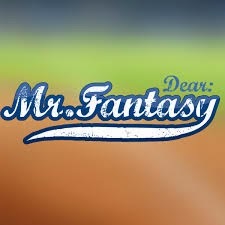 “Dear Mr. Fantasy” podcast: We put the fan in fantasy baseball.